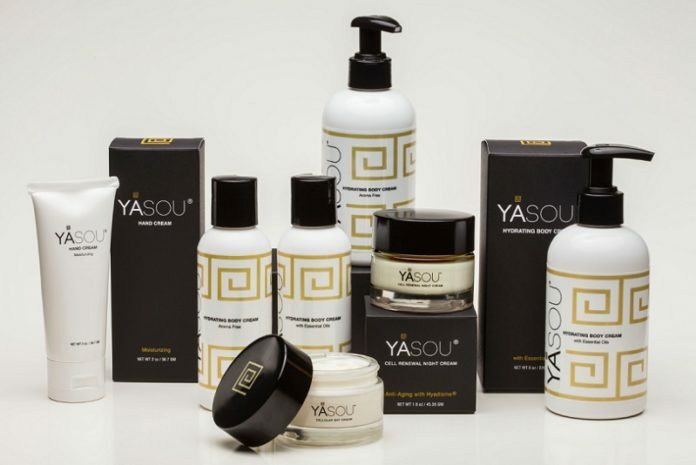 YASOU Natural Skin Care is a Greek-inspired natural skin care line that is all-natural with certified organics, plant-derived, vegan, gluten-free, Leaping Bunny certified, female owned and 100% made in Chicago / USA. What we put on our skin gets absorbed into our bodies, so the ingredients really matter. If we wouldn’t knowingly eat chemicals and toxins, why would we willingly apply them to our bodies without a second thought? YASOU offers full transparency with all-natural ingredients that you can feel good about using. Each product has an ingredient listing on the YASOU website. We are excited to welcome YASOU Natural Skin Care to the Oak Brook Artisan Market at Oakbrook Center on Sat & Sun, May 18-19, 2019. 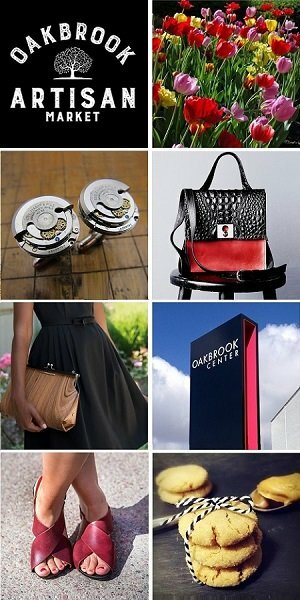 This 2-day outdoor market showcases the Midwest’s finest artisans in fashion, food, home goods + art. Cellular Day Cream – Moisturizes and nourishes to create glowing, healthy and vibrant skin. The cellular day cream delivers a boost of essential, naturally-sourced ingredients, keeping your skin firm and rejuvenated all day long. 99.6% natural with certified organic extra virgin olive oil. Cell Renewal Night Cream – Replenishes and reinvigorates your skin’s beauty. This cell renewal night cream is designed to work in tandem with your skin’s own natural repair cycle. 99.2% natural with certified organic extra virgin olive oil. Hydrating Body Cream – Greek-inspired spa experience at home for the days or evenings you want to nourish your mind, body and soul. Pamper your skin with this luxe wellness product, a Greek-inspired, plant derived (except for beeswax & honey extract), Leaping Bunny certified body cream. This 99.5% natural body cream contains certified organics and the exclusive Calityl-O Complex, which benefits all skin types as it helps form a protective, nourishing barrier that keeps environmental damage and toxins out, while infusing and keeping moisture of skin in. Vegan Hand Cream – Formulated to moisturize, protect, repair and soothe your hands, this is a vegan natural hand cream that contains moisturizing certified organic extra virgin olive oil, coconut oil, bacteria fighters and soothing botanicals. The signature Calityl-O Complex nourishes all skin types. Natural skin care is a part of holistic healthy living. YASOU combines the essence of natural ingredients and certified organics in a way that offers multiple health and beauty benefits. YASOU creates a new level of luxury in skin care. 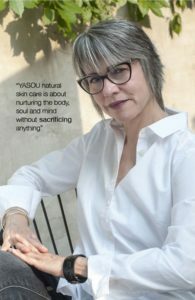 YASOU Natural Skin Care is inspired from the heart, heritage and passion of its creator, Theodora (“Terry”) Ntovas. Terry grew up in Chicago, but often traveled to and lived in Greece as a child, where she spent time visiting her family and soaking up the rich Greek culture and local traditions. As an adult, Terry felt a calling to return to the Greek village that she remembered so fondly from her childhood. While shopping a local farmer’s market, she discovered the purist, most unique, organic skin care products and was intrigued by the beautiful women who swore by them. These glorious products were made from olive oil, natural essential oils extracted from local flowers and indigenous plants, plus organic beeswax. Using what she learned from that small farmers market near Corinth, Terry educated herself in cosmetic chemistry, aromatherapy and natural skin care solutions. Her research led her to partner with chemist/formulator Nestor Tomasi. Inspired by Greek beauty philosophy, together they developed the unique Calityl O Complex, that became the foundation of a truly luxurious natural skin care line. This exclusive and completely natural, luxurious skin care line nourishes the skin and is formulated with the highest quality of natural and organic ingredients sourced from the best growers, producers and suppliers in the U.S.